Research in the Muralidharan lab is aimed at understanding the biology of Plasmodium, the deadly human parasite that causes malaria. It is a disease that afflicts nearly 500 million people and causes almost a million deaths each year. Our goal is to uncover the molecular mechanisms that drive the parasitic life cycle of Plasmodium. The aim of this research is to leverage our knowledge of parasite biology towards development of intervention strategies that disrupt the disease process. We deploy a wide variety of tools to study the parasite including CRISPR/Cas9 genome engineering, cellular biology, chemical biology, molecular biology and biochemistry. Our research focuses on organelle biology in this deeply branched eukaryote. We are particularly interested in the biology of the endoplasmic reticulum and the four-membrane plastid known as the apicoplast. The ER of Plasmodium is the start of a complex and highly branched protein trafficking pathway. 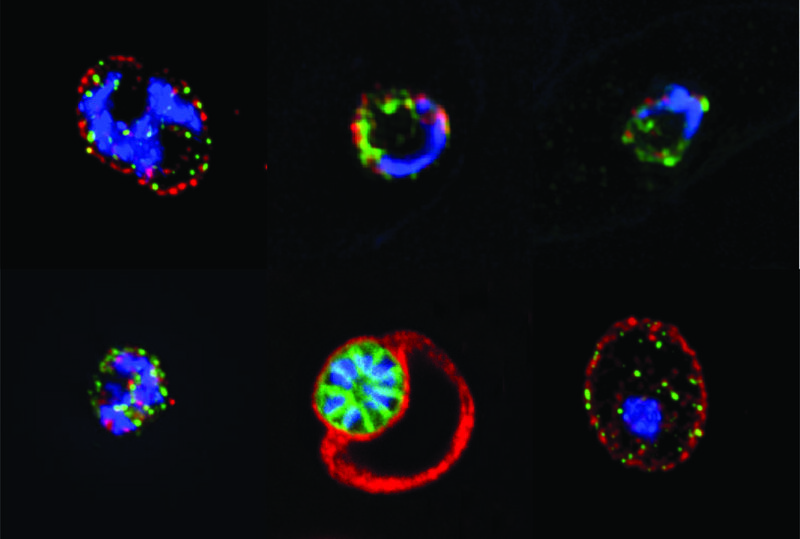 The apicoplast is a unique parasite-specific organelle that provides essential metabolic pathways to these organisms. The clinical manifestations of malaria, including death, are caused by the growth of P. falciparum within the host red blood cell (RBC). To build a suitable habitat for growth inside RBCs, the malaria parasite completely transforms the host cell. It changes the metabolism of the RBC, makes the RBC more rigid such that it is harder for the infected RBC to pass through capillaries, modifies the RBC membrane to allow for favorable movement of nutrients, and alters the binding properties of the RBC so that the infected cell can bind to the endothelial cells lining blood vessels. The sum of these changes leads to disease and death, for instance, binding of the P. falciparum infected RBC to endothelial cells can clog blood vessels in the brain leading to clots that eventually result in death. The subjugation of the infected RBC is accomplished through the action of several hundred proteins that the parasite transports to the host cell via poorly understood mechanisms. The export of parasite effector proteins is essential for transforming the RBC and therefore, for causing disease. Parasite effector proteins that are synthesized in the parasite cytoplasm need to be transported across three or four cellular membranes in order to reach their site of action in the host RBC. We are interested in identifying the molecular mechanisms that recognize, sort, and transport these parasite effectors to the infected RBC. Since human cells are also eukaryotic, it can be tricky to develop drugs that specifically kill the parasite and don’t have too many side effects. The parasitic Plasmodium cell is quite complex with two organelles that carry their own genetic material, the mitochondrion and a unique plastid of algal origin known as the apicoplast. The apicoplast is present only in the parasite and not in the human host. This makes it an ideal drug target since attacking the apicoplast will affect only the parasite and not the human host. In fact, some antibiotics have shown success as antimalarial drugs because they target essential biological processes in the apicoplast. However, the molecular mechanisms that drive the biology of this unique parasite organelle remain unknown, which hampers antimalarial drug development. We are interested in the role of a plastid-localized complex of proteins that comprises of a chaperone and a protease, known as the Clp-complex. In the Plasmodium plastid, the Clp-complex also consists of an inactive protease. Our goal is to understand the role of this complex in the biology of the apicoplast.